I've heard talk about these two projects for a long time, and I'm lukewarm moreso to the second project which I'll explain both. But they are finally going to start construction this year. For those who don't know, I can't find a good map of the existing ramp but I can show an image which shows both the existing and the future configuration. Those who aren't aware of how this works, when you exit the Gardiner here, the exit is signed as York/Bay/Yonge. If you want York St North, you take the loop ramp and keep to the left, if you want Bay St, you take the loop ramp and keep to the right onto a slip ramp onto Harbour, and then make a left turn onto Bay. If you want Yonge, you don't take the loop ramp, but instead take a ramp that descends onto Harbour right before the Bay St intersection, this is only one lane and you can't turn either direction from this offramp, you must proceed straight, and therefore you make a left turn onto Yonge....so currently, only York St had a direct interchange with the Gardiner, this ramp is seen as somewhat of an eyesore by many. As you can see from the above diagram, the replacement ramp will be a simple ramp which descends onto Harbour around Lower Simcoe Street, and therefore if you want York, Bay, or Yonge in the future, you simply stay on Harbour until you meet those intersections. Harbour will be widened to accommodate this. 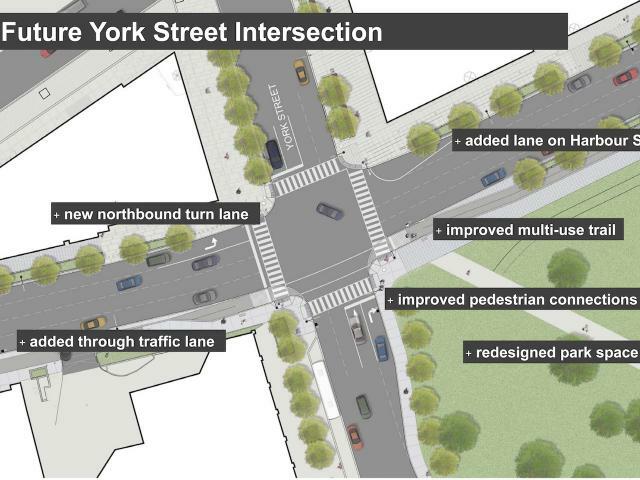 My real only concern is the York/Harbour intersection, consider the before and after. Of course, an immediate added bonus is that currently, you couldn't turn left onto York from Harbour, now a dedicated left turn lane will allow vehicles to turn onto York. So this is a positive, as a driver, if I wanted York St from Lake Shore, I had to do a bunch of moves on other streets to reach York, like using Rees St and then Bremner. But if I decide to use Lake Shore now, I have direct access to York. What concerns me however is that arguably one left turn lane may not be enough, I always thought a fully protected dual left turn movement would be best for this intersection, pedestrians generally obey fully protected left turns with my experience, they don't barrel into the intersection just because they see a green which commonly happens during an advanced green with a green light and green left arrow. Other than that, this could probably make the area better, I will admit that I will miss taking that loop ramp down to York, for those who want one last ride, the ramp will be permanently closed on April 17....Lake Shore/Harbour will instead be accessed from the Spadina exit while the new ramp down is constructed. 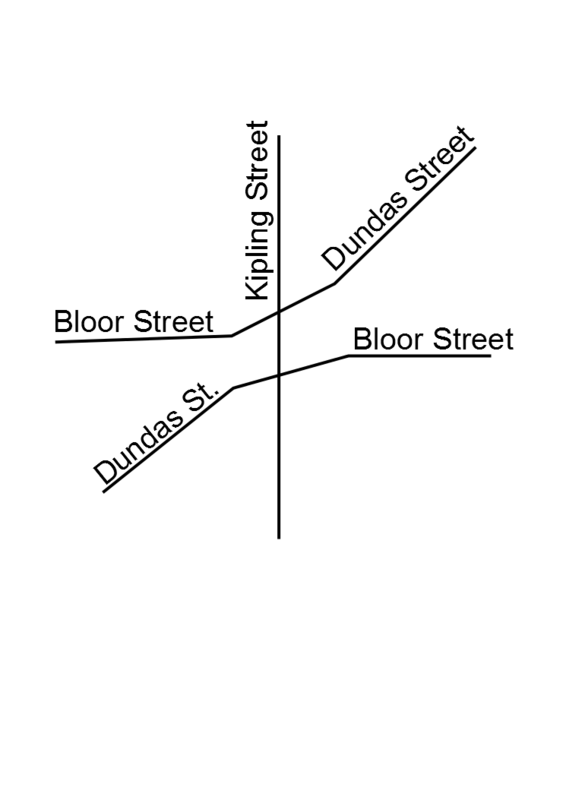 The general North-South street is Kipling Ave, Dundas Street generally travels diagonally from the south west to the south east, and Bloor St, is the main east-west street along the upper half of the map. While this better connects the three streets, the traffic pattern before made more sense in how most traffic travels. As you can see from the old map, Bloor St was the natural continuation of Dundas coming from the west, indeed this is how the interchange is designed, if you drive straight you'll go from Dundas St to Bloor St, and otherwise, Bloor St to Dundas St. Indeed, this route made up the old Highway 5 which has since been decommissioned. What I am basically trying to say, the natural flow is for Bloor if heading west to become Dundas, Bloor west of Kipling Avenue is a significantly different kind of corridor compared to the stretch east of Kipling. This means, I predict the future intersection of Bloor/Dundas/Dunbloor to have long backups to make a left to reach Dundas St, previously this was a simple through movement with no traffic lights at all, it's a shame that this kind of natural continuation couldn't have been tried to be preserved. Even the Bloor Subway line has Kipling Station more closer to Dundas, and it was assumed that if a future extension of the subway were to happen, that it would follow the alignment along Dundas. Remember, Dundas St has an exit with Hwy 427 and Bloor does not, Dundas is an arterial in Mississauga which continues into Halton Region and beyond. Bloor west of Kipling and into Mississauga really has the status at best of a minor arterial, I'm not sure if it can be classified as a collector or not. These are my thoughts on this, what is your opinions on this. It's complicated, Dundas is an important street east of here as well, although it kind of travels all over the place until it finally forms a straight line east of Lansdowne Avenue, indeed follow the path and Bloor & Dundas actually meet later at a straight intersection. I think many hate the overall "eyesoreness" of the interchange. This interchange isn't entirely free flowing, that loop ramp from NB Kipling to WB Bloor/Dundas has TWO stop signs in what should be yield signs (there isn't acceleration lanes here). But as I said, Bloor loses it's importance WEST of Kipling, Bloor & Kipling may see an improvement, but Dundas seriously loses, and Dundas is a very important arterial west of here into Mississauga. This comes as no surprises, considering all the barking you hear from so called experts regarding tearing down the Gardiner completely, but I digress. 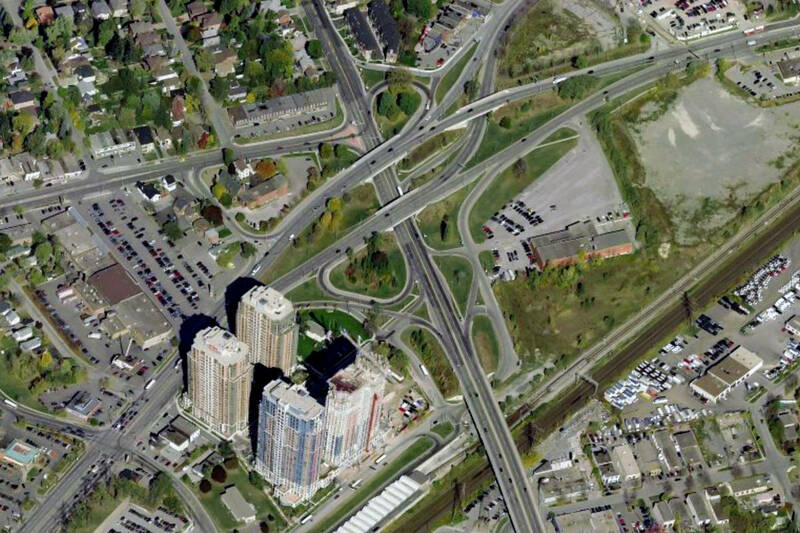 Sure, the interchange wasn't perfect before, but it allowed for a lot practical movements, like those on Dundas wanting to stay on Dundas.....the faultiness of the intersection involved getting to WB Bloor, meh something tells me all these empty spaces created will be filled with even more condos. The first one is very similar to the exit for Tillary Street off the westbound BQE in Brooklyn. You see this helix and you think of all the expensive real estate that is going to waste. It would be great if it can be used in the right way. The second one is also a monstrosity, but probably needed. I can't imagine what type of traffic you'd get with three busy arterials meeting at one point. You sort of need to have at least one of them grade separated. This is similar to Grand Ave in the NW suburbs of Phoenix. It used to be many busy six point intersections that are now mitigated thanks to the grade separations and ramps. Ugly but necessary. Cool thread MisterSG1, thanks for posting this. I probably wouldn't have known about these project otherwise. The first one happens to be the only exit I use on the Gardiner (for the few times a year I drive to downtown Toronto). At least the proposed changes seem reasonable enough to me, though I'll miss the unique setup they currently have (I always thought the loop ramp in downtown looked cool, but that's how you know I'm a roadgeek ). I can see your concerns with the six-points intersection. I've only driven through there once or twice, but I can only imagine how busy it must be. I'm also not sure why this project is really necessary. Do they plan on using some of the land in that intersection for development. Or maybe the idea is to make it more friendly for pedestrians and cyclists? Otherwise, it seems like a lot of work to arguably make the intersection worse (in terms of car traffic anyway). The six-points intersection (in it's current form) is actually really cool from a roadgeek perspective! It's crazy how many ramps and side streets are involved. Yeah, the removal of the interchange is part of a master plan for the area which in addition to better bike/ped accomodations also includes new parkland on the former site of the interchange and new development around it. The interchange is immediately adjacent to the Kipling subway station, which is the western terminus of the Bloor-Danforth line. Quite a few buses already converge on it so it's already a transit hub and therefore a prime location for transit oriented development. But, the interchange takes up a lot of space, and therefore it has to go if the vision of creating a small community around the subway station is to be realized. It's also worth noting that currently if you exit Kipling station at the east end, it puts you on the sidewalk of St Albans Rd which has the interchange on one side of it and wild growth on the other - not the sort of place that's exactly pleasant to be walking through on a regular basis, especially after dark. To get to the development to the northeast you need to follow this forlorn path and then cross Bloor at Resurrection Rd. 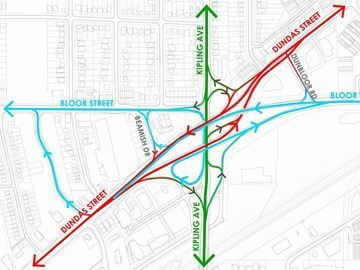 With the interchange gone, you'll still need to cross Bloor, but will be able to do so at Dunbloor which will make some people's walk shorter. And everyone's will be more pleasant if there is a park and more development in the area. 1) Cross St Albans Rd without a crosswalk, walk across the grass to the sidewalk on Kipling, and then follow said sidewalk all the way through the interchange, having to walk right across several pseudo-freeway-style entry/exit points in the process. 2) exit at the west end of the station, walk up Aukland Rd and then back on Bloor, which is a lot less harrowing than option 1 but depending on where you're going a lot longer. With the interchange gone, walking up Kipling will be similar to walking up any other street, and safer because every lane of traffic you need to cross will have a red light at some point while you have a walk signal - unlike now where it's uncontrolled and you have to play Frogger. Now, the timing on all this is somewhat odd because the interchange is not (as best as I can tell) at the end of its useful life, but there is well thought out reasoning behind what is being done. The need to make a left turn from Bloor to Dundas does strike me as a point of concern as well, but they've done traffic studies and said studies seem to indicate it won't be an issue, so we'll see. I don't really like it. I prefer arterial roads to be perfectly continuous. I like that Bloor will now be continuous, but hate that Dundas will now be completely disjointed. If only the demo proposal was made a few years earlier before the condos on Dunbloor were built. 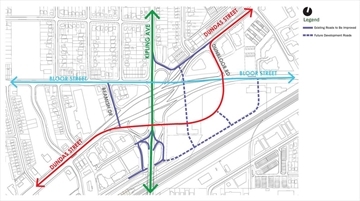 Then the course of Dundas could have realigned to avoid Bloor and Kipling completely. Though I can see the traffic problems that will result with the primary arterial role-switching between Bloor and Dundas. 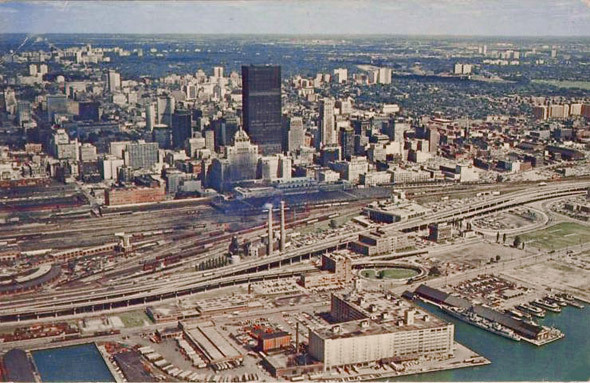 When CN was a crown corporation, they built the obvious CN Tower, as you can see, much of that land south of the rail corridor was a giant railyard....indeed when the Gardiner Expressway was built, the overall environment resembled more of the environment when driving on Burlington St in Hamilton. I'm not exactly sure when everything changed, but as you can see, everything south of the rail corridor was pretty much industrial land. Regarding the Six Points, I think it's quite obvious that all that space that was freed up will be used to build....you guessed it, more condos. I will address more of the issues in my response to Duke87. Kipling has always been a transit hub, no doubt about that. But for most commuters, exiting at Kipling is not their final destination. The vast majority of people who get off the subway at Kipling will head upstairs to the bus terminal to reach other parts of the city. Notice that only the TTC uses this terminal, MiWay (formerly Mississauga Transit) operates out of Islington Station.....so they are going to have to cross this hell to reach Islington station. There is a plan to build a new terminal at Kipling for the Mississauga buses, but when this will happen, god only knows. If not taking buses, the next group of commuters either get picked up at the "Kiss & Ride" or they walk back to their vehicles and drive to where they are headed. THERE ARE VERY FEW COMMUTERS who leave the station here and walk. That east end exit is a rather recent addition to the station, it opened up in 2011. I assume it sprung up because of the addition of the condos on the southwest side of the interchange. First thing, THE INTERCHANGE IS NOT ON THE WEST SIDE OF the St Albans Entrance, Kipling Ave is elevated here because this is the bridge that crosses over the CP tracks (which also serve as the Milton GO line as well), so you will always exit beside those "ugly" bridge piers no matter what. The exit onto St Albans was again a recent addition, and to be honest, if you want the Dunbloor condos by walking, it's probably more practical in either sense to get off the subway at Islington and walk along Bloor, especially when you factor in the time it takes for the subway to reach Kipling from Islington in rush hours. If you want to go north, you can always simply take TTC 45 Kipling, shows up every 5 minutes for most of the day, and every 10 minutes at night. The problem you suggest with St Albans and reaching Kipling will still exist afterwards, remember the St. Albans exit didn't exist until 2011, this station operated for over 30 years without it, and the vast majority of commuters enter on the Aukland/Subway Crescent side. It's the thinking of modern day planners, CARS BAD, PEDS AND CYCLISTS GOOD. The neighborhoods themselves aren't entirely attractive, with just condos, this is essentially a bedroom community for those wanting to go downtown, what I've described as an urban suburbia. 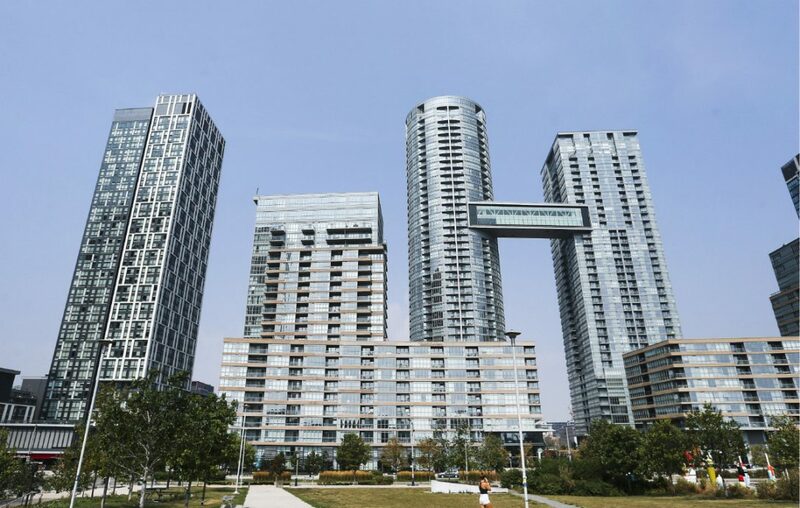 When you visit the CityPlace neighborhood, that's the buildings that immediately surround the SkyDome *cough* I mean Rogers Centre, and the buildings west of Spadina on Fort York Blvd. These buildings have mostly the same kind of stores on the bottom that you expect to see at your suburban power center (which I always hear a a common criticism of suburbia, how it's all the same) There is no real sense of a city here, it's just buildings, it feels cold and sterile, that's how I describe it. Similar kind of developments surround Square One in Mississauga, the Scarborough Town Centre in Scarborough, the only real example of something that actually has a good mix of residential and office space is North York Centre, which is roughly defined as the area between Hwy 401 and Finch Ave on Yonge Street. This was part of a grand plan since the 1980s by Mel Lastman (then mayor of North York) and it actually kind of feels like a "downtown" despite having a six lane Yonge Street. Although Bloor shares the same name, as I described earlier, Bloor west of Kipling ought to be called something else really, compare the streetscapes of Bloor & Dundas west of here and you'll see what I mean, Bloor is practically a residential collector. Indeed, Bloor doesn't even reach Hurontario in Mississauga, whilst Dundas is a major arterial throughout Mississauga and continues westward beyond Halton Region to become Hwy 5. As Bloor west of the six points is more of a residential area (compared to Dundas or Burnhamthorpe), it was actually fairly well shielded from motorists trying to use it as an alternate path....indeed, Bloor West is currently only directly reachable by SB Kipling, you CANNOT turn onto Bloor West from NB Kipling, you have to use Dundas and take Aukland to get up there, this sort of explains what I mean. Making Bloor continuous kills the longstanding relation between Dundas and Bloor through the Six Points and will arguably encourage more traffic to use Bloor than Dundas. Dundas is designed for the larger traffic volumes, there is no question about it whatsoever. the only real example of something that actually has a good mix of residential and office space is North York Centre, which is roughly defined as the area between Hwy 401 and Finch Ave on Yonge Street. This was part of a grand plan since the 1980s by Mel Lastman (then mayor of North York) and it actually kind of feels like a "downtown" despite having a six lane Yonge Street. I think it especially feels like a big city up there because of Yonge being six lanes. Even more so than it does downtown itself, where its narrow width makes the city look smaller than it really is. Very short answer, aside from the specific location when the work is occurring, it shouldn't mess things up too much more than they already are. If your itinerary in Toronto is mostly the downtown core on foot, then maybe parking further afield and taking VIA or GO Transit might be your preference. I don't think there will be a significant time savings (which is why I usually end up driving straight into downtown instead), but it certainly can be a lower-stress option if less familiar with the city. They are doing this to better accommodate pedestrians. But I don't think it is a good idea because most people in Toronto (except maybe in Downtown) drive cars, and doing this just makes traffic slower while there are very few pedestrians.